7.3 Where can I find mail sent from SuperMemo? incorporate learning into your e-mail communication. Important! 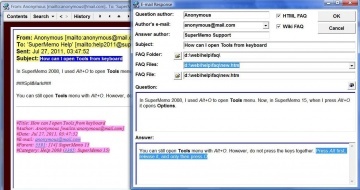 To fully use e-mail functionality in SuperMemo you will need MS Outlook 2000 or later. At the very minimum, MAPI compatible mail would be needed for sending mail. For example, with Outlook Express you will be able to send mail from SuperMemo, but you will not be able to use the wholesale import of mail in incremental reading. (optionally) Preview mail in your Outlook Inbox: delete spam, process one-liners (mail that requires only short answers and is not worth archiving), categorize mail by moving it to separate folders (e.g. Business, Family, Pictures, Learning, etc. ), forward mail that may be processed by others, etc. Incremental reading is a set of tools that make it possible to develop a number of strategies adapted to particular mail processing needs. The strategy will be different when processing mail from family or friends. It will be different when processing business mail. It will also be different, and perhaps most effective, when brainstorming over e-mail. If you do not have Learn : Postpone : Auto-postpone checked, instead of using Mercy for handling overflow, consider using Postpone on the outstanding material. Choose View : Outstanding and click the Postpone icon. For example, if you choose to postpone by a factor of 1.2 (i.e. 20% increase in intervals), all pieces of e-mail with intervals of 7 days or less will be rescheduled for the next day (i.e. tomorrow). This is because 20% increase on 7 days is 1.4 days, which rounds up to one day. When processing e-mail, you can choose to reply to a question with an FAQ (i.e. question-answer pair). Responding via FAQ is the best way to retain the context of the question, even if you reply with substantial delay. Reading : E-mail FAQ on the component menu makes it possible to use the selected text as a question in an FAQ. The FAQ will be sent as a reply, and stored in FAQ files (as HTML and/or Wiki). You can edit your FAQs in the HTML component. Use Reading : Split : Insert splitmark on the component menu to separate question from answer with a splitmark. Once the FAQ is largely complete, select both the question and the answer, and choose Reading : E-mail FAQ from the component menu to polish its HTML, preview it in the WYSIWYG mode, and send it. The FAQ will be sent as a reply, and stored in FAQ files (as HTML and/or Wiki). Where can I find mail sent from SuperMemo? How can I postpone one element only instead of the whole branch or all outstanding pieces of e-mail in incremental review process? How can I sort items from low to high intervals in incremental e-mail processing? 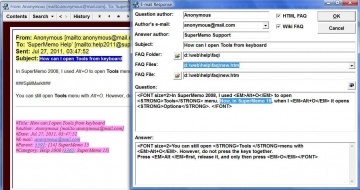 You can use this method in e-mail processing in the same was as in the learning process. You can also use this method to sort mail by priority, last review date, etc. It is most convenient to use auto-sort and auto-postpone when processing mail. This way you can be sure that mail of highest priority is scheduled at the beginning of the outstanding queue. I imported an e-mail to incremental reading. In the meantime the return address has changed. How can I make sure SuperMemo does not keep using the old address by default? Can I safely remove texts that SuperMemo adds at the and of mail I send?